Bio means “Life” and Diversity means “Variety”. In short variety of life is called biodiversity. While conservation means maintaining earth biodiversity. Diversity of life in all forms and at all levels of organizations. The richness abundance and variability of plants and animals, species, communities and their ecological process that link them with one another with soil, air and water. Alpha Diversity: The type of diversity taking place within communities is called alpha diversity. Beta Diversity: the type of diversity taking place between communities is called beta diversity. 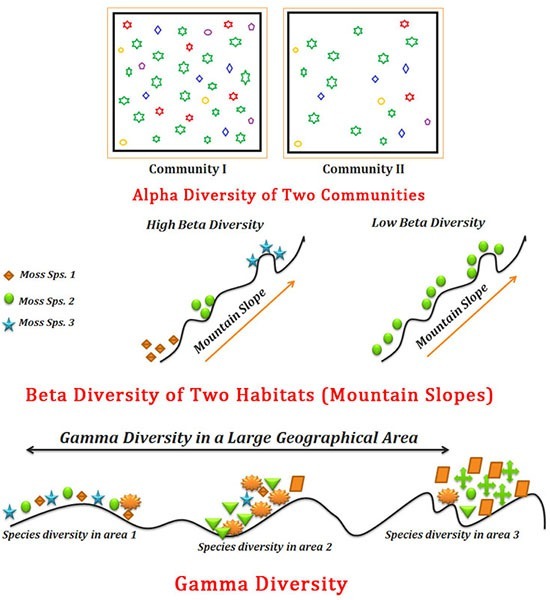 Gamma Diversity: The diversity which is on original basis explaining difference among similar habitats. The diversity of ecological function is enormous. Millions of species of earth interact with one another species through ecological process such as competition, parasitism, predation, mutualism etc. Every species interacts with its physical environment through process that exchange energy and elements between living and non-living world such as biotic and abiotic factor. Such as photosynthesis, biogeochemical cycle and respiration. All these fictional interactions must total billions. The Diversity of Evolutionary Function is even more complex. It includes all ecological process because they are key elements of natural selection plus process such as genetic mutation. Functional Diversity is clearly important. For example, management plan designed to keep a species from a becoming extinct will almost fail in long run unless the process of evolution specially natural selection, continuously allowing the species to adopt the changing environment. Conservation biologist usually focus on maintaining structural biodiversity rather than functional biodiversity for two reasons. Maintaining structural biodiversity usually more straight forward. Structural biodiversity is successfully maintained functional biodiversity will probably maintain as well. E.g., if we maintain species of orchid and one of its insect pollinator together in the same ecosystem than we will probably have pollination interaction between two simultaneously we can maintain orchid genetic diversity. In short if genetic species are maintained successfully a diversity of ecological and evolutionary with probably maintain. 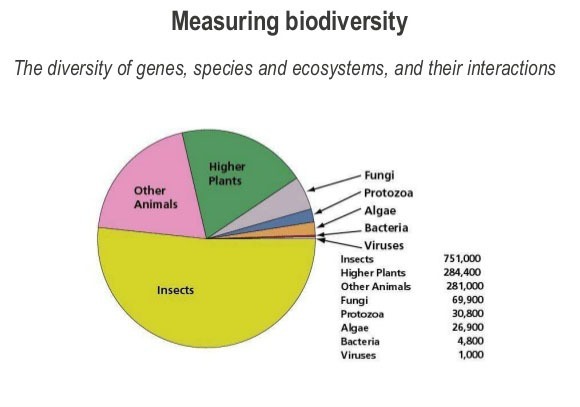 Biodiversity can be measured by following steps. The qualitative description of species including number of elements of biodiversity (usually number of species) is called species richness. Percentage Cover: The proportion of each quadrate occupied by the species is called percentage cover. Population Density: No, of individual per quadrate is called population density. Species Frequency: Population of quadrate with a species in it. When both species richness and species evenness increases the biodiversity also increases. Both have the same richness (6 species), but field b has greater evenness. So, field b is more diverse. A high value of D is good and means that b habitat is diverse, species rich and able withstand some environmental impact. A low value for D is poor and means that habitat is low in species so a small change to the environment e.g., pollution would have a serious impact. Field b has high diversity index so has more species richness and evenness it would be more resistant to any environmental change or damage.